Popular hacking group name as "Anonghost" who supports the hacking activist group "Anonymous" in many of the its operation have hit the cyber space regularly. As regularly they are hacking and defacing mostly Israel site, as per the post made on its official facebook fanpage. To All Governments of the World,We are watching you , we can see what you're doing, we control you , we are everywhere. people who do your laundry and cook your food and serve your dinner. We make your bed. We guard you while you are sleeping. We drive the ambulances. We direct your calls. We are cooks and taxi drivers,we are everyone you come into contact with on a daily basis. We know everything about you. We process your insurance claims and credit card charges. We control every part of your life. Together we stand against the injustice of corrupt Governments. We are AnonGhost. We are Legion. United as ONE. Divided by zero. The domains which are hacked by the hackers are nod32.ps, eset.ps, antivirus.ps. 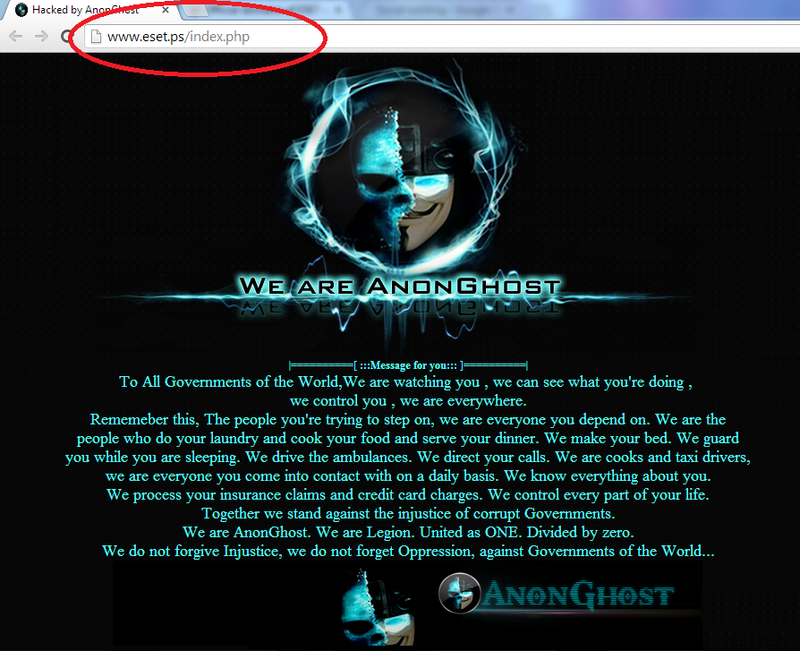 At the time of writing all the websites are defaced. You can check the site and mirror of the hack.